The USB-C cable might be the new standard in connecting electronics but it's also becoming the latest piece of kit to be counterfeited, which could be putting devices at risk. Tech firm Satechi, however, has launched a gadget to detect faulty and counterfeit cables. The USB Type C cable has the same Type C connectors at both ends, unlike other USB cables, which have different sized plugs for different devices. The Type C plug is about a third of the size of older USB plugs and it has the aim of connecting all electronic devices, from charging a smartphone to connecting a hard drive to a laptop. The ingenuity and growing popularity of the USB-C cable, however, has made it a target for counterfeiters and consumers are being warned that buying a cheap knock-off could damage the various connecting electronic devices. According to Gizmodo, a USB-C cable can draw upwards of 3 amps to charge a laptop, making devices vulnerable to damage if the cable is of sub-standard quality, is unable to handle the load or doesn't properly regulate power draw. Enter Satechi's USB-C Power Meter; a small device that measures voltage, current and power input and output in real time to detect whether the USB-C cable is faulty or not. It works as a "pass-through" adaptor that connects between the USB-C cable and the device to provide the information on power flow. However, while it can detect power flow issues, Satechi's power meter can't protect a device, act as a surge protector or have built-in alarms. The onus is on the user to ensure the information detailed by the meter is in line with what is expected for the device and to remove the cable if there is a discrepancy before damage can be done. 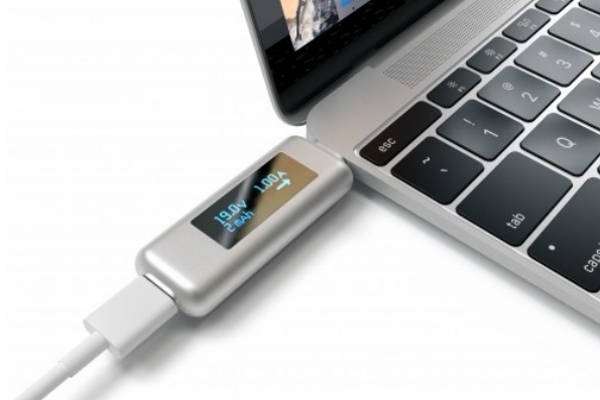 Satechi believes the power meter will help consumers avoid counterfeit USB-C cables. "This device is really useful for testing your accessories and peripherals to make sure they're operating at their advertised specifications. This will let you weed out any counterfeit products or products that aren't functioning as they should," the company said in a promotional video. "When choosing a charger or accessory for a device, users need to know the maximum voltage and amperage it can use to ensure they do not permanently damage their hardware. The USB-C Power Meter quickly and easily measures voltage in real time, amps being input a device and how much power has travelled into your device since it started charging…and ensuring counterfeit or incompatible accessories do not destroy or fry laptops, tablets and smartphones," the company said. Counterfeit electronic chargers and accessories are a growing problem in the marketplace. Last year, an Apple investigation found that almost 90 per cent of Apple-branded iPhone chargers and accessories on Amazon were fakes, while a UK investigation revealed that 99 per cent of fake Apple-branded chargers failed to be safe enough to protect against electric shocks.